Palin: "This is not a man who sees America as you and I do"
ENGLEWOOD, Colorado (CNN) -- Alaska Gov. Sarah Palin on Saturday slammed Sen. Barack Obama's political relationship with a former anti-war radical, accusing him of associating "with terrorists who targeted their own country." Alaska Gov. 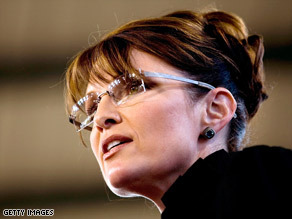 Sarah Palin lashed out at Sen. Barack Obama's ties to controversial figure William Ayers. Palin's attack delivered on the McCain campaign's announcement that it would step up attacks on the Democratic presidential candidate with just a month left before the November general election. "We see America as the greatest force for good in this world," Palin said at a fund-raising event in Colorado, adding, "Our opponent though, is someone who sees America, it seems, as being so imperfect that he's palling around with terrorists who would target their own country." Obama's Chicago, Illinois, home is in the same neighborhood as Bill Ayers, a founder of the radical Weather Underground, which was involved in several bombings in the early 1970s, including the Pentagon and the Capitol, and the two have met several times since Obama's 1995 campaign for a state Senate seat. Palin cited an article in Saturday's New York Times about Obama's relationship with Ayers, now 63. But that article concluded that "the two men do not appear to have been close. Nor has Mr. Obama ever expressed sympathy for the radical views and actions of Mr. Ayers, whom he has called 'somebody who engaged in detestable acts 40 years ago, when I was 8.' "
Riot and bomb conspiracy charges against Ayers were dropped in 1974, and he is now a professor of education at the University of Illinois in Chicago. Obama campaign spokesman Hari Sevugan called Palin's comments "offensive" and "not surprising given the McCain campaign's statement this morning that they would be launching Swift Boat-like attacks in hopes of deflecting attention from the nation's economic ills." With Obama rising in polls while the country struggles in the grip of a financial crisis, Sen. John McCain's presidential campaign decided to shift attention away from the troubled economy and onto issues of his opponent's character, judgment and personal associations, the Washington Post reported. "We're going to get a little tougher," a senior Republican operative said, requesting anonymity because he wasn't authorized to discuss strategy. "We've got to question this guy's associations. Very soon. There's no question that we have to change the subject here." McCain campaign spokesman Brian Rogers told CNN, "We are coming up on 30 days until the election, and there are a lot of unanswered questions about Sen. Obama's judgment. The Obama camp said the tactic wouldn't work. "What's clear is that John McCain and Sarah Palin would rather spend their time tearing down Barack Obama than laying out a plan to build up our economy," Sevugan said. Obama and Ayers attended a meeting for a school reform project in 1995 and met again later that year when Ayers held a campaign event for Obama when then-Illinois state Sen. Alice Palmer, who planned to run for Congress, introduced the young community organizer as her chosen successor, campaign spokesman Ben LaBolt said. Both men also served on a charitable board together, he said. Labolt also said the two have not spoken by phone or exchanged e-mail messages since Obama came to the U.S. Senate in 2005 and last met more than a year ago when they encountered each other on the street in their Hyde Park neighborhood. Obama and McCain will meet for their second debate Tuesday night and will take questions directly from voters in a town hall-style format. CNN's Drew Griffin contributed to this report.